RightITnow ECM (Event Correlation Manager) software aggregates, filters and correlates your high-volume of infrastructure and application events into a streamlined number of actionable alerts. With RightITnow ECM, your IT operations staff can proactively detect, isolate and respond to infrastructure issues before they impact customers. RightITnow ECM also facilitates IT operations process automation by enabling the creation and execution of automated workflows, including one to efficiently connect the flow of alerts from the Operations Center to the Service Desk. Who need high-volume event collection, filtering and correlation across their different monitoring tools. Who are ready to replace their legacy Event Management systems with RightITnow ECM’s cost-effective enterprise-class capabilities, simplicity and usability. 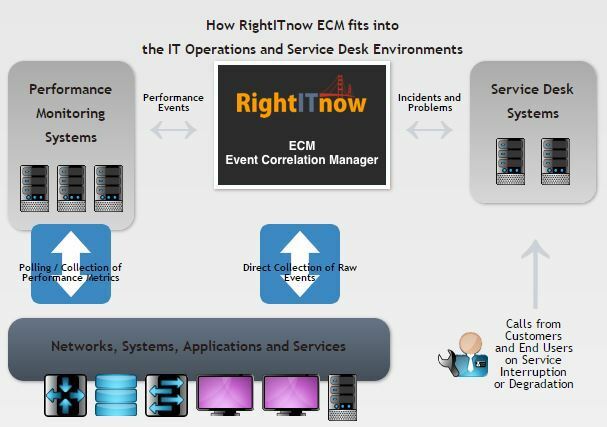 Why Do You Need RightITnow ECM? Your IT environment consists of complex, multi-tiered infrastructure and application assets that need to work together perfectly to support the delivery of business services. All of these IT assets generate event notifications that track their status and ongoing changes. It’s likely that your organization has deployed multiple active monitoring and management systems to track the performance and availability of individual infrastructure components and end-to-end services. These monitoring systems also generate their own events sending notifications for everything from unreachable instances, to performance anomalies to service interruptions. Taken together, your IT infrastructure components and monitoring systems can generate tens of thousands to millions of events each day. Many of these events are informational, while some hold meaningful and critical information on potential or ongoing failures. However, given the high volume of raw events, IT operations teams cannot put the knowledge of real-time events to direct use. They necessarily need some level of intelligent event correlation and reduction into relevant alerts to feasibly and economically manage the IT operations process. RightITnow ECM fills this gap, by making your IT Operations and Service Desk teams more effective and productive.